Work has started on what is thought to be the world’s first hospital to be built to the Passivhaus standard. 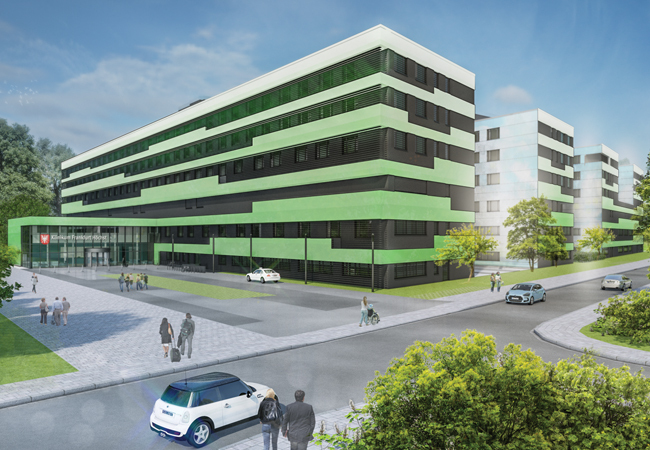 The Passive House Institute has been involved in the planning phase of the Klinikum Frankfurt Höchst, which will include operating theatres and 666 beds over six floors. The hospital management hopes to ‘drastically reduce running costs’ while also improving ‘internal operational procedures’, according to a statement. Reducing energy demand while providing improved comfort is ‘particularly worthwhile in the case of a hospital building’, said the Institute’s Oliver Kah. Balancing the special hygiene-related requirements for sensitive areas, such as operating theatres, with comfortable room temperatures is a key focus of the design team. At the ground breaking ceremony, the state of Hesse’s Minister for Social Affairs Stefan Grüttner pointed out that Hesse currently incurred annual energy costs of €3,350 per hospital bed.